Are you looking for the right summer music camp? Look no further. I’ve had the pleasure of being involved with some of our area’s finest music camps. I am especially proud of the camp “Jay” Scott and I co-founded during the summer of 2006 at the University of Puget Sound (Puget Sound Brass Camp). We found this partnership between the University of Puget Sound Community Music Department and Metro Parks Tacoma to be very successful. This coming summer the camp will be in its third year. We also co-founded the Bellevue Brass Camp (at Music Works Northwest) the following summer. 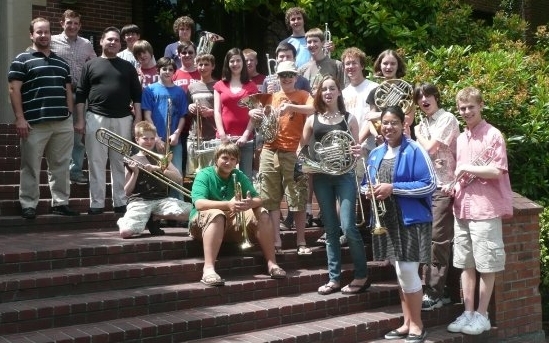 Last summer, we launched the Seattle Brass Camp at a North Seattle Community College. For our Brass Camps, we usually limit enrollment to 13-18 years of age (for exceptions, please contact us). For a preview of our brass camps, please CLICK HERE. We’re on Facebook, if you’re interested! You won’t want to miss this one of a kind adult music camp in Walla Walla, WA: Wine tasting, music, skits, brass ensembles!